Your neighbor is there every day, greeting you with that same smile, child in a stroller, beagle on a leash, passing your garden. Funny how much she looks like the woman flying around the track at the Roller Barn. The one with the tattoos, helmet, mouth guard, and sleeveless tee, leaning, twisting, and shoving her way through a crowd. Could they be the same person? Did your mild-mannered neighbor join an outlaw biker gang? Is she out to bust up the town after she skates? 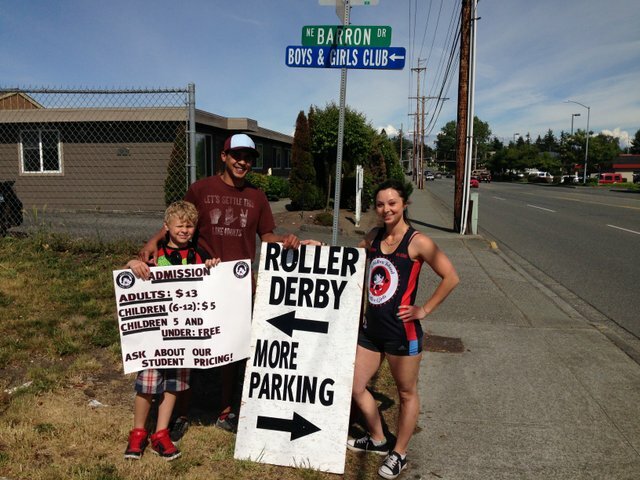 “We get that a lot,” laughs “Adelita Beatah,” the public relations chair for Whidbey Island Roller Girls. 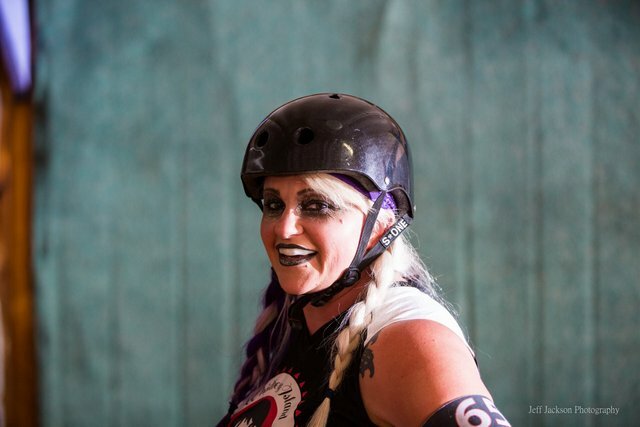 When she’s not skating, Beatah sheds her derby name and persona and becomes Monica Lopez. She serves the community as a case manager and advocate for homeless housing. “People think we’re a bunch of beer-drinking hooligans. That’s just not true. We build character and empowerment among women. We come from everywhere in the community. We’re teachers, active-duty Navy women, and at-home moms. We are Chamber of Commerce members. We volunteer everywhere, supporting local charities and especially our hosts here at the Roller Barn, the Boys and Girls Club. 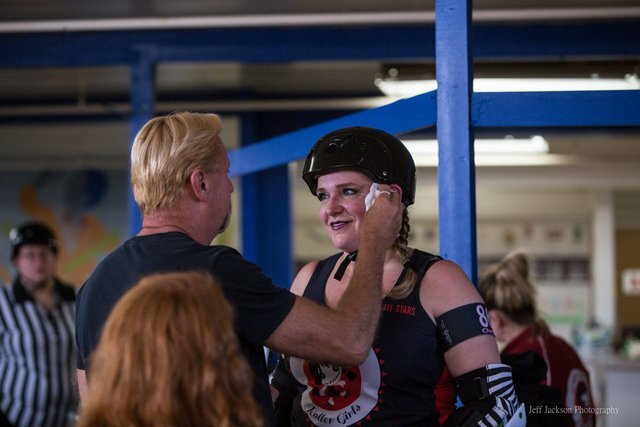 Before a Saturday bout at Oak Harbor’s Roller Barn, there’s a unique paradox afoot: skaters’ affection for each other, even for the competition, is about to morph into unbridled aggression on the track. 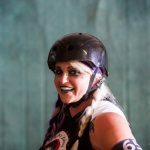 Derby names lay it right out there – shocking or funny, sweet or unprintable, from the far side of that chasm that separates your sweet neighbor from the terror on wheels you see at the bout. Machete n Meatballs (Lauren Maynard). T-Wreckz Yo Face (Tracie Bryant). Hippo Pottymouth (Sandra Kimberling, who skates for the competition). The local women circle the track sharing hugs and high fives with their opponents: Overbeaters Anonymous. “Suzy Bruizy” (Susana Hendrick) runs the merchandise counter, hawking T-shirts and team gear. She’s wearing a leg brace, and her crutches rest in the corner. You get the feeling that this club changed Bruizy’s life. What’s it all about, this sisterhood, this sport that arouses such passion? Derby rules and play are simple on paper. The oval course features two straightaways 35 feet long and 15 feet wide, connected by sweeping turns. 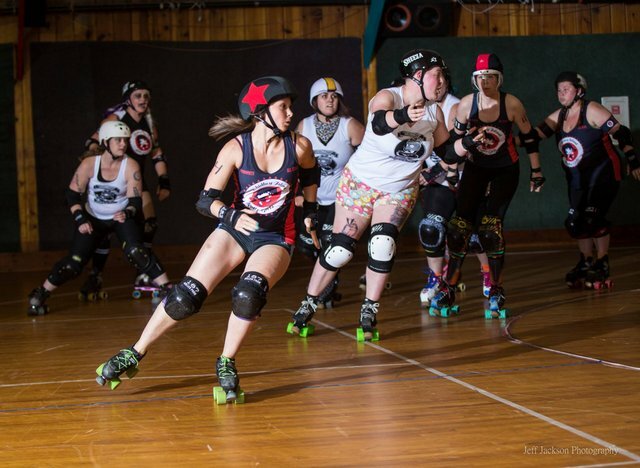 Four skaters from each team jostle in the starting area, and at the referee’s whistle, a fifth – the “jammer” – from each club attempts to break through the other club’s four blockers. The jammer tallies points for every opposing player she passes. This is no brutal pro-wrestling relic of the 1970s. No elbowing, grabbing, punching, or tripping is allowed. There’s a penalty box for offenders. Jamming and blocking are about hips, shoulders, teamwork, and agility. 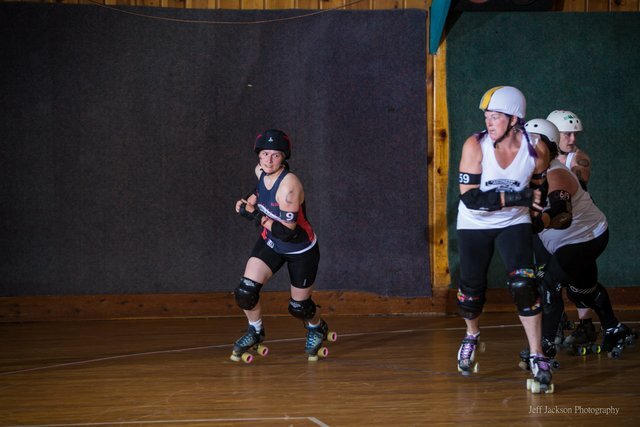 Whidbey scores first, tallying four points as jammer “Wild Sockeye” (Whitni Schurr) darts through the pack. The home crowd loves it, but the Overbeaters take control. 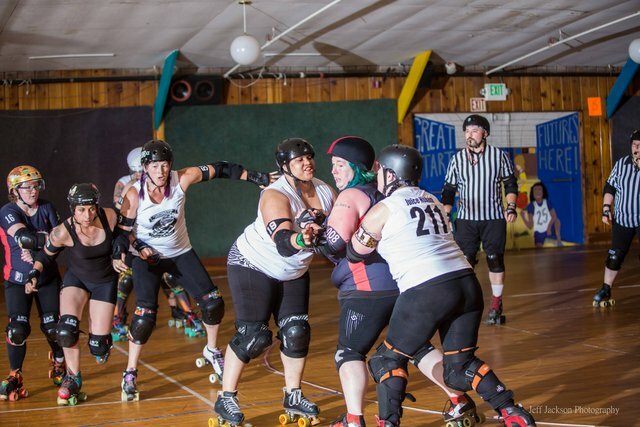 By halftime, the visiting team, which is made up of plus-size skaters who call themselves “fatletes,” leads by more than 100 points. Whidbey looks stronger in the second half. They skate with precision, tap dancing along sidelines and scoring with confidence. But the visitors won’t let them close the gap, and the 100-plus margin remains as the final seconds tick away. When the bout is over, nobody’s down about it. Both teams skate through high fives and embraces from each other and from cheering fans. Everyone’s smiling. Overbeaters coach “Thurston Gore” (Aaron Managhan) excuses himself from an interview: there’s a group photo shoot, both teams, mingling, hugging, mugging for the camera. 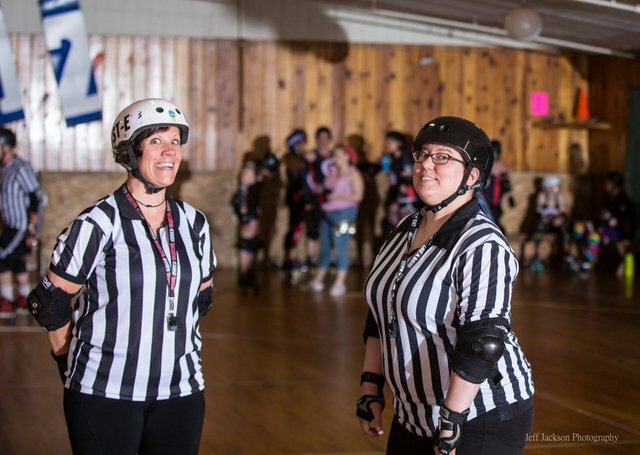 Adelita Beatah stands straight and tall on her skates, telling a stranger that she weighed more than 300 pounds when she joined the club. She spent her first practices holding on to the wall all the way around the rink and needed a railing to get up when she fell. That same woman now skates with pride and confidence: she’s lost well over 100 pounds and gained immeasurable self-esteem. We hear “empowerment” in political settings, meaningless in far-off partisan arguments. 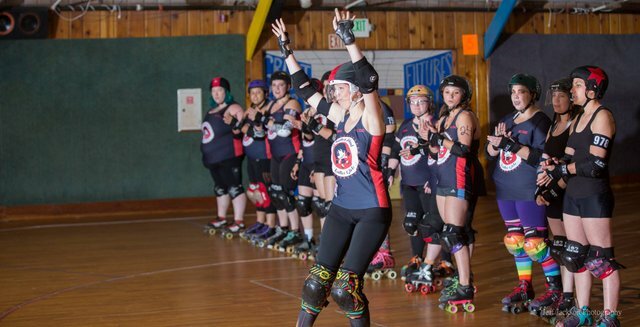 But here on Whidbey, when ten women skate around a track, and do it with love and power, it brings the meaning home. It’s about a woman taking control of her life. It’s about pride and confidence. Club founding member and current Women’s Fast Track Derby Association liaison “Glory S” (Kristen Adams), with her neon green hair and incandescent smile, exudes pride when she talks. “I’m not the only original. There’s one… and one over there… and there’s even one skating for Overbeaters,” she says as she points out the pioneers who got WIRG off the ground in 2010. 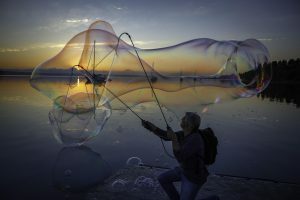 “We want to keep growing. Everybody’s welcome,” she adds. 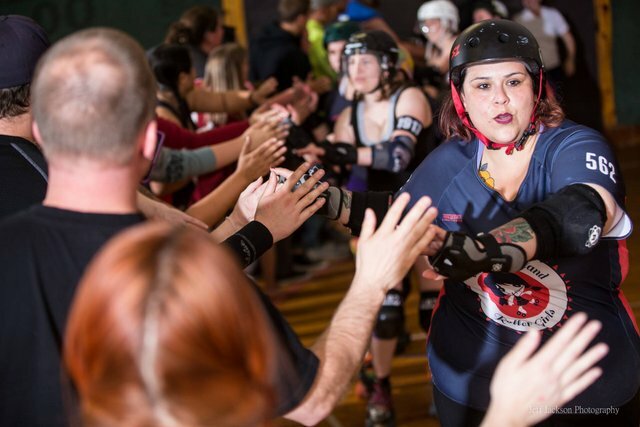 Fresh Meat Roller Derby Boot Camp is on Sundays from 5 to 7 p.m. for women who want to be part of it. The next 10-week series runs from September 20 through December 20, 2017. Makes sense. There was a lot of love in the air. “The Smiling Butcher” (William Walker) is a writer who lives in Oak Harbor. His first novel, “Diamonds and Dirt,” will explore parents’ obsession with sports and their adulation for abusive coaches. The Butcher follows the Mariners and Yankees, gets lit up about our judicial system’s lack of support for victims, and keeps you up-to-date on all of it at www.playininthedirt.com. Delightful article about fascinating women and this sport. 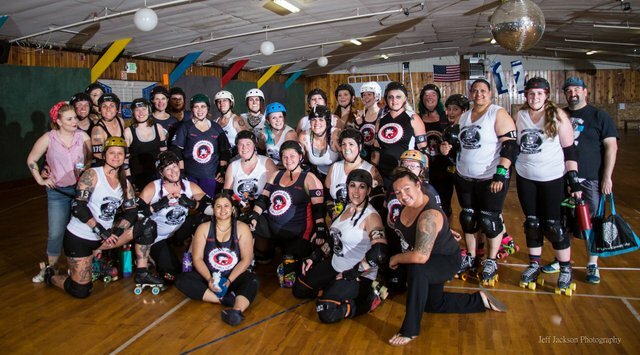 This is so well written; the intro is intriguing; the descriptions of the players w/roller derby name (and their every-day name) and enough to let us know their love of the sport and Whidbey is delightful.